The Polish Bishops conference will be meeting in Warsaw for a plenary meeting on June 9th and 10th. The topic of marriage will be included on the agenda. This blog will report on the continued bishops opposition to the innovators promotion of Holy Communion for adulterers, as well as on those who advocate for individuals who indulge without repentance in deviant sexual acts. 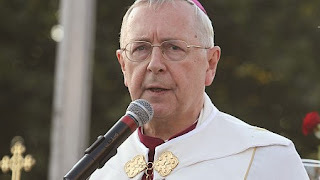 The Polish bishops, along with the African bishops have been one of the strongest voices in upholding the unchangeable doctrine on the indissolubility of marriage and the impossibility of giving Holy Communion to someone who is living an adulterous lifestyle. Be assured that the Polish bishops will mightily and absolutely oppose any effort to overturn Familiaris Consortio of St. Pope John Paul II. The innovators - the adulterist and homosexualist parities - sinister cardinals, bishops and priests (organized in a worldwide cabal loyal to satan) may advocate pandering and excusing grave sin (e.g. claiming that "intrinsically disordered", when referring to evil homosexual acts in the Catechism of the Catholic Church, is to be considered "offensive", as so denoted by Fr. Thomas Rosica recently in January, 2015). This blog, and the now preeminent Catholic blog in Canada, Vox Cantoris, will expose and denounce any and all evil attempts to overthrow the teachings of Our Blessed Saviour. God bless you, and keep up the good work. No rest for the enemy! I am adding my prayers for the faithful warriors among the clergy and the nuns. Yes, they are shrinking in size, but the few remaining ones are each worth a thousand! Remember in the days of Moses, how the Lord turned the army of the enemy against its own self? While the Israelites were looking on, that army totally annihilated its own self! Praised be God, and peace to His people on earth. Though Poland has a strong episcopacy, let us not be fooled: Poland has a massive demographic problem - a huge increase in contraception and continual access to abortion in enormous number (though officially severely restricted). In other words, Poland is dying.